Rap music and I have a tenuous relationship. As time goes on, I’m increasingly puzzled as to whether rap wants me to love it. Maybe these are the symptoms of getting old and washed up; when I was young, rap is all I cared about. The music consumed me at my most pretentious years and I both cherished and defended it. Today, I find myself more interested in revisiting older music–from both my youth and before my time–due to a growing disinterest in what’s happening now. All of that being said, rap has always been ridiculous and fodder for comedy. The most self-serious rapper out is just as humorous as many gimmicky artists; it’s entertainment at the end of the day and the inherent humor in the outlandishness and boisterousness add to its charm. CB4 is a silly little film that involves people who love rap making fun of it. Directed by Tamra Davis, a music video director for rap and alt darlings like NWA and Sonic Youth, CB4 is the story of Albert (Chris Rock), Euripides (Allen Payne) and Otis (Deezer D) and an obsession with rap their families just don’t understand. The three boys are desperately trying to find a gimmick that’ll give them the opportunity to get a slot at a famous nightclub run by a drug kingpin named Gusto (Charlie Murphy). One day, Albert heads to the nightclub in the early afternoon to beg for a timeslot for him and his friends to perform and ends up inadvertently helping the FBI bust in on Gusto and his crony, 40 dog (Ty Granderson Jones), in the midst of a drug deal. Naturally, Gusto thinks he snitched on him but it doesn’t matter; he’s going to jail and Albert realizes that the best move for his rap career is to embody the tough guy gangster as a character. He convinces Euripides and Otis to follow his lead and Cell Block 4 aka CB 4 (named after the jail cell Gusto was thrown in) is born, with Euripides as Dead Mike, Otis becoming Stab Master Arson and Albert becoming (what else) MC Gusto. Calling CB4 a sharp critique of rap in 1993 is probably giving it too much credit, but it is very obviously made by people who enjoy rap music a great deal. It’s filled with plenty of gags and references to what was happening at the time: from gimmick rap and silly dance music to record industry execs trying to cash in to political candidates making anti-rap a platform. 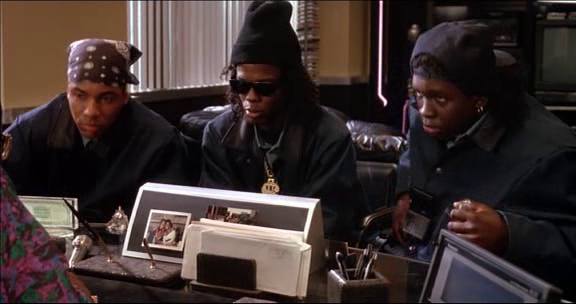 CB4 themselves are a parody of NWA and the impact gangsta rap had on rap at the time as well as the critiques about it. Within the group, Dead Mike played the role of the militant black Brand Nubian type while Stab Master Arson was the uncle Luke type woman-obsessed DJ (naturally he was the one with a hundred little sisters). CB4 is pretty easily the highlight of Chris Rock’s career as a writer or filmmaker–he wrote it along with Nelson George and Robert LoCash–and that’s kind of a bummer. Of all the black comedians who should’ve made that Eddie Murphy/Richard Pryor transition to making great film work, Chris should’ve been the one to do it. The problem I’ve long suspected, is that Rock needs to be reigned in by other great writers. Left to his own devices, he tends to get trapped in this mode of taking movies he loves and turning them into one-liner heavy caricatures. With a Nelson George (or a Louis CK or Wanda Sykes), he can be utilized in a constructive way. For as silly as CB4 can be, it’s a very controlled and focused film. The jokes may not always land, the story may have some cheesiness to it but all of it works. It’s a film that’s been vindicated over time but still doesn’t get the attention it deserves. I’ve often wondered how a film like CB4 would look today: is rap (music in general really) might be too niche-ified and vast for it but CB4 proves that a lot of the same things that are ridiculous now were ridiculous then, which puts a damper on all that nostalgic rose-tinted waxing about the good ole days. As I type this, a number of MC Gustos have popped up on Datpiff and that’s probably how it’ll always be. Rap music frustrates me deeply but I hope it never changes. Keep pumping out that music straight outta LoCash.